Kirkby Stephen and District Angling Association controls some 9 miles of fly fishing on the River Eden with a further 4 miles on the River Belah and Scandal Beck. 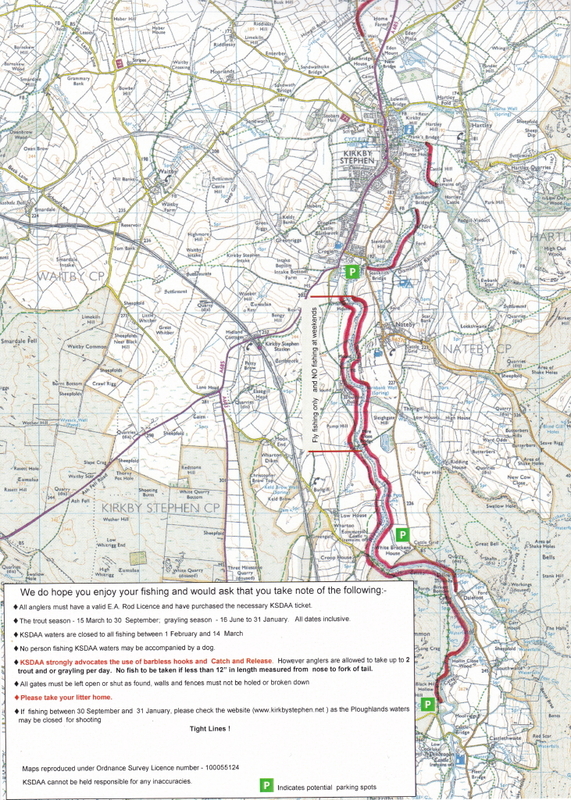 River maps are on the Links page. 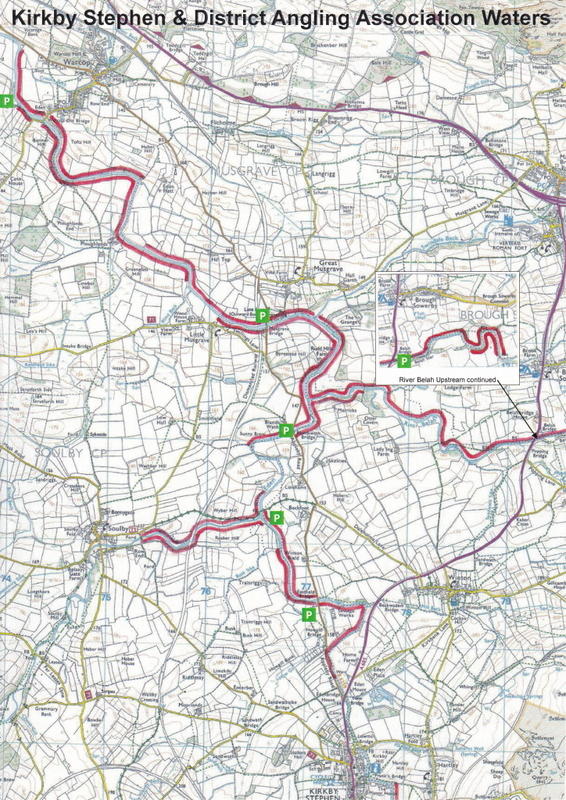 Kirkby Stephen & DAA control 13 miles of fishing on the Cumbrian Eden upper reaches. Upstream of Kirby Stephen the River Eden runs briskly with fast glides and deep pools with the occassional longer smooth runs. Downstream of Kirby Stephen the river takes its time and flows through beautiful countryside. There is plenty of double bank fly fishing for the wild brown trout which can reach up to 5lbs in weight. However the fish are wild and a very careful approach is necessary if you want to suceed. Weekly Tickets are available for holiday breaks and are available from the Secretary Mr Colin Edney Tel 017683 42073, and are at a cost of £50. 1. Popular wet & dry flies see below. 4. Thigh waders will cover most of the waters although chest waders are accepted. 1. That no member shall be allowed to fish the Association's waters until he has paid for and received the appropriate ticket. 2. Fees for season resident and season visitor tickets must be paid by 1st April. 3. Any person fishing the Association's waters must carry the appropriate ticket which must be shown on demand, together with a valid EA rod licence. 4. The Trout Fishing season shall begin on 15th March and end on 30th September (both dates inclusive) as per North West Water Authority Bye-laws. The KSDAA Grayling season runs from 16th June to 31st January. The Association's waters are closed to all fishing between 1st February and 14th March inclusive. 5. Ticket holders may fish for trout and grayling in season. 6. Holders of Day and Weekly tickets are permitted to fish for trout and grayling with fly only. 7. The Wharton Hall water is restricted to fly only and no fishing at week-ends. No spinning is allowed between New Bridge and Trainriggs. 8. No person fishing the Association's waters may be accompanied by a dog. 9. All catches shall be shown to a fellow member on request. 10. KSDAA strongly advocates Catch and Release, and the use of barbless hooks. However, members and visitors are allowed to take up to 2 trout and/or grayling per day and no more than 100 per season. No fish to be taken if less than 12 inches in length measured from nose to fork of tail. 11. The sale of fresh water fish by ticket holders is strictly prohibited. 12. No fish roe, medicated bait or other illegal bait shall be used and bait feeding shall not be allowed. Any person in breach of this rule may be liable to prosecution. 13. All gates must be left open or shut as found, walls or fences are not to be holed or broken down and the provisions of the Country Code must be observed. 14. Any day/weekly ticket holder found to be in breach of these rules shall be asked to cease fishing and leave the Association's waters forthwith. 15. Any Season Resident or Season Visitor member found to be in breach of these rules shall have the benefits of membership withdrawn for such a period as the Committee shall decide.